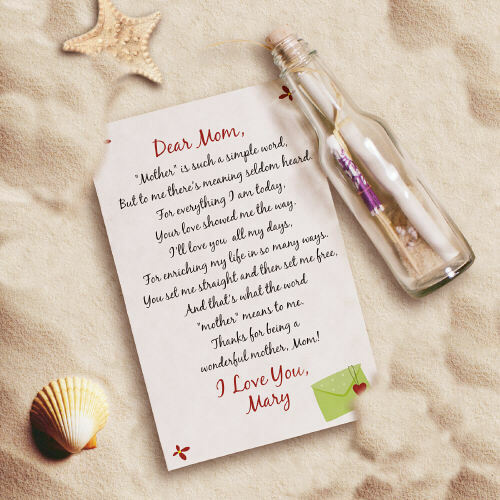 Our Personalized Mother's Day Message In A Bottle is one of our great gifts for mom and is a creative and heartfelt way to share your thoughts to your Mom or Wife on Mother's Day or any special day! She is sure to love this thoughtful, personalized gift and keep it as a treasured keepsake forever. The 6 1/2" glass bottle comes with sand and seashells, beach umbrella, and your very own custom message. Each personalized message is printed on parchment paper with flower graphics, then rolled, tied with a ribbon and corked on top. Can be shipped to you or directly to your mother. Custom message can only be up to 10 lines and 30 characters each line. 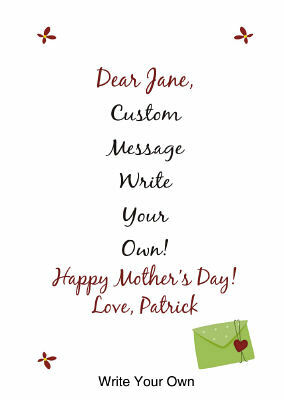 Choose from 3 verses or Write Your Own and we'll custom personalize your chosen message along with your Mother's first name at the top and your 2-line ending sentiment below the verse. Great Idea, Love the option that your able to write your own message & Verse. Don't like the fact that its a regular bottle with decoration or message written on the bottle itself, but for the price you really cant ask for much. Beautiful message - will make my daughter cry with happiness. Beautiful - will make my daughter cry. GiftsForYouNow offers many great Personalized Gifts for Mother’s Day that your Mother or Grandmother will cherish for years to come. We have an extensive collection of Personalized Mother’s Day Frames, Personalized Mother’s Day Shirts & Personalized Keepsakes. Place your favorite Poem onto one of our Personalized Mother’s Day Poetry Gifts or place your favorite Photo onto our wonderful Personalized Photo Gifts.